My work with telepathy enables people to see the past and the future. All art involves telepathy, and my work acknowledges this, continually embracing associated and necessary weirdness. The culture and aesthetics of telepathy and psychic life permeate the ‘everyday’. My art works creatively with telepathy to better understand and change the world. Rosalind Krauss discussed telepathy, performance and video art many decades ago.1 Krauss’ more recent idea of the post-medium condition is also embedded in the model of video art.2 I am not alone as an artist working with this idea of post-medium telepathy. Furthermore, this description suits my practice better than the term ‘video art’ or ‘painting’. Emotion and ideas are the best medium, not necessarily people materializing spirits so literally, not ghosts and ectoplasms and not techniques and technologies. There is plenty of telepathy, ghosts and technologies in emotion and ideas. My artwork and artist-self channels and transmits emotion and ideas in whatever medium necessary, and art provides both intimacy and distance. Theorist Lisa Blackman also illuminates telepathy, bodies and media through her use of psychoanalysis and Deleuzian-inspired affect theory.3 Telepathy occurs in communicative transmission and contagion through bodies, weather, flows and media. Blackman develops a haunted technologically-mediated notion of self that extends beyond the individual’s body. Department of Corrections (DOC) – Escape: Woman, 177.5cm tall, medium-heavy build and long braided dark brown hair, wearing orange jumpsuit with text ‘DOC’ printed on the left breast and full text ‘Department of Correction’ printed on the back. Facial features are obscured by a balaclava woven out of black telecommunications wire, with an 80cm extension from the crown of the head. The telepathic balaclava assists divining and navigating via waterways. The fascinator extension can stand upright, like a unicorn’s horn, and it develops a curved flexibility and sway when encountering large rocks, dense tropical rainforest and thick vegetation. It vibrates side-to-side and back-and-forth through submerged and semi-submerged movements over and around rocky rapids and through deep waterholes. Weather Underwater: Once the escapee is reunited with fellow cult members, the cult collaborates in an underwater mission to gather evidence of The Disappeared. The cult was ambiguously associated with Weather Underground during the VHS era, and more recently with the Earth Liberation Front (ELF) during the HD era, resulting in many disappearances from the media. Mainstream media does not report many recent and very real acts of sabotage by ELF upon power stations and other environmental hazards. Underwater cult magic—consisting of mutant telecommunication wiring, alternative power dressing, and fish dancing rituals—raises disappeared skeletons from amongst the dead coral. These videos are part of my ongoing long-term Weatherman UFOlogy project. Human characters are developed within natural elements of the tropics whilst the UFO remains under construction. Underwater missions provide good opportunity to adapt to Outer Space and test the telepathic balaclava as an all-purpose breathing apparatus. Climate change, ocean warming and reef death greatly concern the cult members. Their culture of recycling is a magical act of resistance. The cult employs labour-intensive feminine processes of recycling man-made materials to create the magical garments – stitching in space with telecommunications wire and dresses made from unpicked men’s neck ties. Telepathic Balaclava: This headpiece is a telepathically-wired balaclava. It is a fetishitistic war fascinator. Stiff lace and stitching in space use the hardware of cyberspace to create new software, a recycled cyber-meshworks and elf-like antennae. Craft-involving meditative repetition creates something in which lace work and barbed wire meet. It is a unicorn’s horn, an umbilical cord, a DNA phone-cord spiral, and with Elven magic it transmits and receives. Stitching in space with telecommunications wires is a meditative practice that results in the emission of Extremely Low Frequency (ELF) wavelength signals, and an emasculated ectoplasm-like substance with barbs where knots are tied. Scientists acknowledge that if telepathy exists, it is most likely synonymous with ELF signals. Power Dresses: Dresses are made from unpicked men’s neckties that are sewn together. Each dress can be zipped up to create a dress for the individual’s body, or alternatively zipped together with other dresses to create a powerful omni-dress. Underwater they enable a mermaid discourse with the fish and coral. Far North Caribbean: With the help of UFOs and telepathic cults, the tropics develop an ethical cannibalism and de-territorialisation. 1. Krauss, Rosalind. 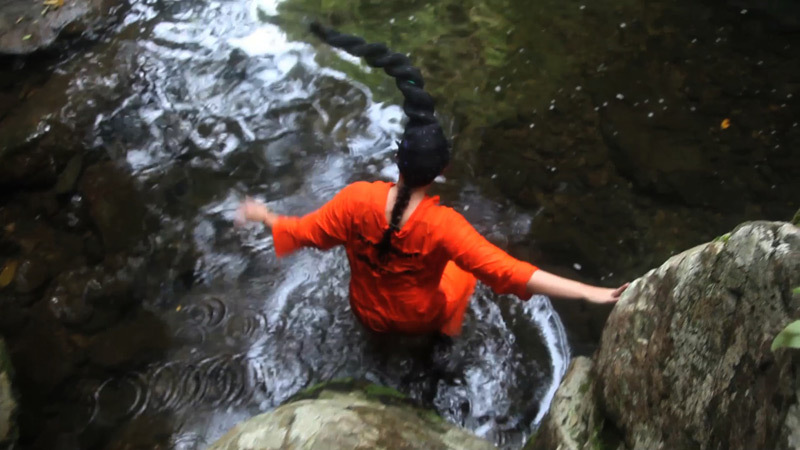 ‘Video: The Aesthetics of Narcissism.’ New Artists Video: A Critical Anthology. Ed. Gregory Battcock. [October 1.1] Spring 1976; NY: E. P. Dutton, 1978. 43-64. 2. Krauss, Rosalind. Perpetual Inventory. Cambridge: MIT Press, 2010. 3. Blackman, Lisa. ‘Embody Affect: Voice Hearing, Telepathy, Suggestion and Modelling the Non-conscious.’ Body and Society. 16, 2010. 163-192.